Another couple and my husband and I spent 4 days in the Amalfi Coast region of Italy this summer. I had been to Italy before, but not this area. Oh my word should it be on your bucket list, friends! The fresh food, the intense wine, the sheer cliffs cascading into the deep blue Mediterranean Sea. . . it was all intoxicating. A word to the wise: the Amalfi Coast is a UNESCO World Heritage Site. As such, there is no construction of modern highways along the coast. It is all windy, tiny roads were tourists and locals alike zip through on motorcycles and mopeds, SUVs and sedans. Throw in pedestrians, parked cars and passersby and the whole driving in Italy thing hits home. The roads are treacherous, so either steel your nerves, get insurance for your rental, or take public transportation – there’s plenty. But I digress. We flew into Naples, found our rental car, and hit the road. Our first destination was the seaside city of Sorrento. The city is supposedly named after Ulysses hearing the “sirens” call of the mermaids from its shores. Tell me how cool is that? I literally swam in the same shores that Ulysses swam? I love history and travel. Sigh. That’s Mt. Vesuvius in the background! But I digress again. Sorry. 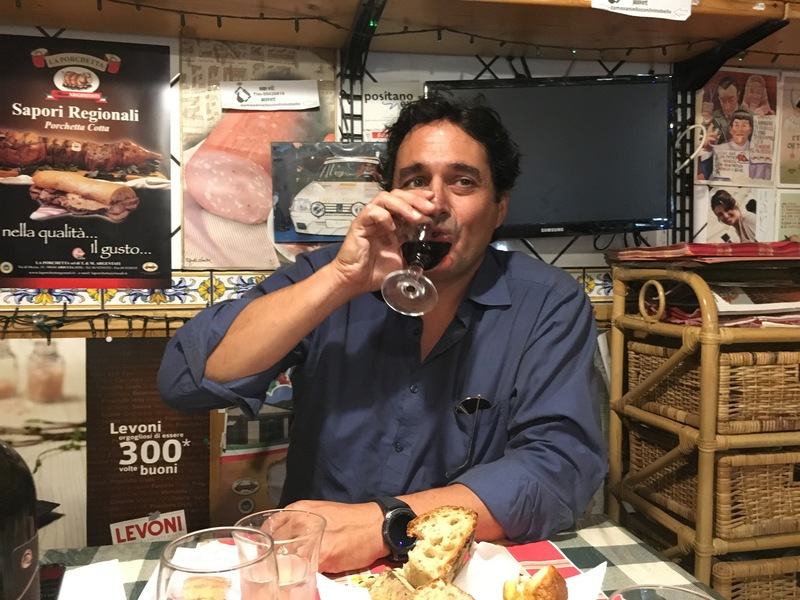 That’s how Italy was for me: a series of digressions from real life – one delectable bite or one dramatic cliff after another. We spent the night in the bustling city of Sorrento, which is mired in Moorish art (I’ll get to the art in another post) and located at the base of Vesuvius. Sorrento was busy, and filled with Italians trying to sell limoncello or lemon art to American tourists. 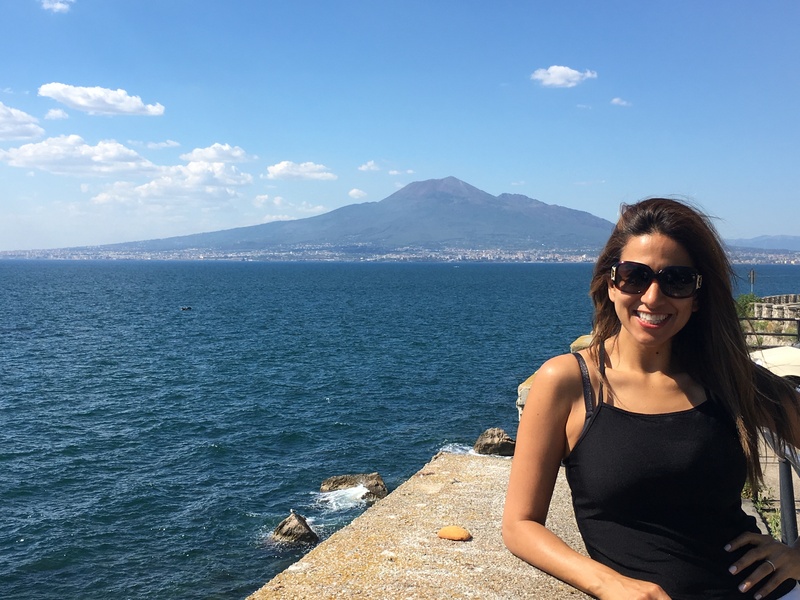 Truly – I heard more American accents in Sorrento than I do on the streets of New York City. Sadly, I found that slightly off-putting. It’s just me, though. When I travel, I like to think of myself as an explorer – going to the ends of the Earth, and not some place that has already been discovered a thousand times over. Imagine a female Indiana Jones (isn’t Indiana a girl’s name, after all?). But of course Amalfi Coast has been discovered. As I already mentioned, it’s a UNESCO World Heritage Site! And it’s unbelievably beautiful. The next day, we awoke to brilliant sunshine and bluebird, cloudless skies. We were off to our next destination: Salerno. On our windy way from Sorrento to Salerno, I needed to stop at the pharmacy and pick up some dramamine for a boat trip planned the following day to the island of Capri (more on Capri in another post. Sorry! There’s just far too much to cover in one post – and I know you can’t read for hours). The coastal road is dotted with tiny villages that come alive in the summer and board up for the winter. We found a large green pharmacy in Sant’Agnello and pulled over. My husband had to stay by the car, while I ran into the pharmacy (parking was illegal on the side of the road). As I walked back to the parked car, I noticed a small fruit stand of a market and the largest, juiciest and most fragrant apricots waiting to be eaten. 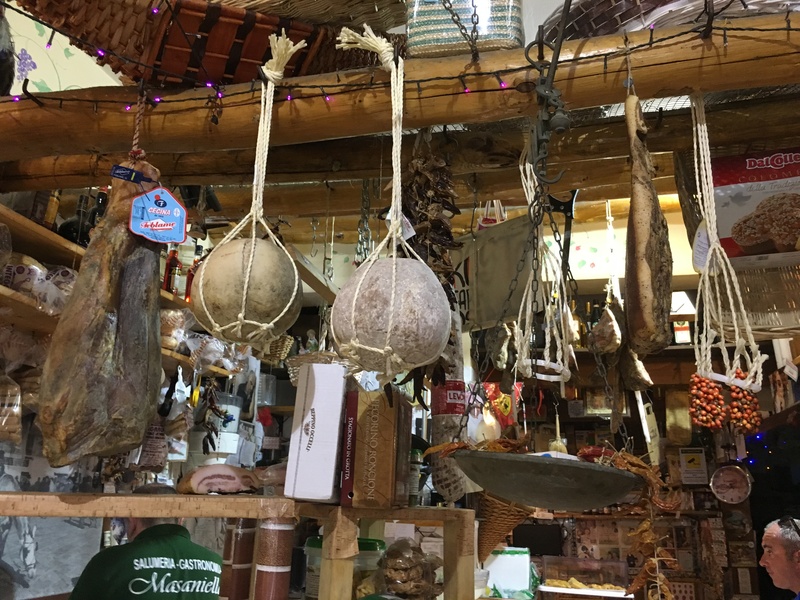 Behind it was a large glass window and I could see hanging from the ceiling: gorgeous, large, cylinder-shaped salamis, large round cheese circles, and strings of garlic and tomatoes – all drying in the window. My foodie instincts went up immediately. I headed inside. It was an Italian family-owned deli and restaurant. The lights were darkened, the room drenched in dark wood. My eyes took a second to adjust from the brilliant sunlight outside. But my other senses came alive. The slightly mildewy scent of aging cheese, coupled with fresh tomatoes stewed in garlic and basil, wafted right to my nose and down to my hungry belly. 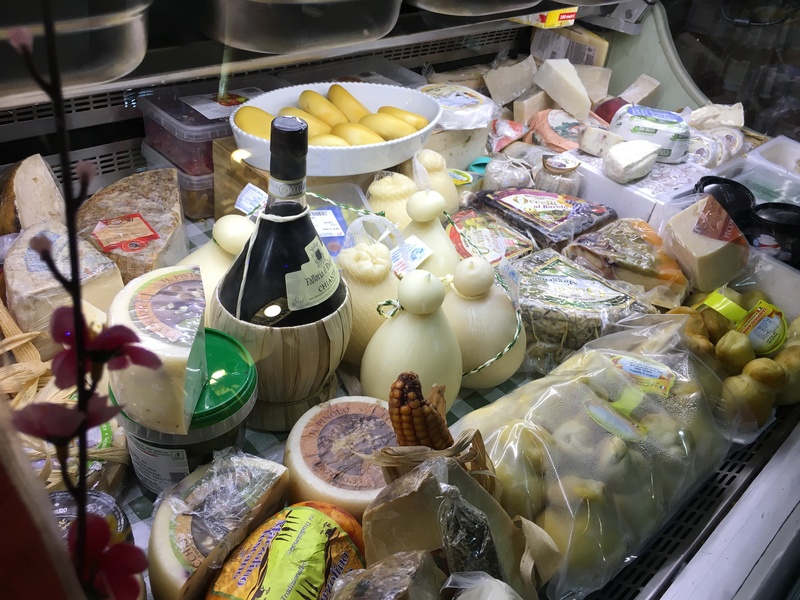 The assortment of local, knotted cheeses- most of which I had never heard of were displayed in a simple refrigerated section to my right. There were olives. Oh were there olives! – black, green, seasoned, pitted, cured, spicy, and beyond. As my nose was pressed to the refrigerated window, I’m pretty certain a little dribble of saliva was coming out of my mouth. This place was my jam. The door opened, letting bright sunlight in for a split second. My husband loomed in the doorway. For a few minutes, I had completely forgotten that I left my husband in a rented car in a foreign land without telling him where I went. He found a parking spot and was searching the pharmacy and other merchants before finding me asking the owner to try the marinated olives. A Puteca E Masaniello’s is truly a magical place. The owner Nello was kind and inviting, with a warm smile and a gracious handshake. We sat in the back stall and provided us morsels of what we asked for. I wanted a small portion of eggplant Parmesan, a portion of Nicoise salad and some olives. My husband ordered a slice of homemade, oven fired pizza that was spectacularly thin, with artichokes, garlic and more Parmesan on top. He is also a sucker for cheese, and so had several wedges of local cheese that he and Nello spent time deciding on which would be the best fit for my husband. When we were seated and eating, Nello pulled out this amazing rustic bread and two glasses of local red wine. As a thank you for our patronage, Nello also brought out a small round tuft of fresh mozzarella. It was still warm, it was that fresh! I sliced it open with a knife to share, and the whey spilled out onto the plate. This was the most incredible mozzarella I had ever had. My husband and I sat in the back of the deli – where only 2 booths were set up with black and white checkered tablecloths. It was the most humble of restaurants (I use that word liberally), but it was the most authentic and delicious food I had enjoyed in ages. I highly recommend it. Nello is charming and the perfect host. We bought a couple of bottles of local red wine and wrapped up whatever cheeses we could not finish. We paid under 40 Euros for the meal plus 2 bottles of wine, chunks of cheese and wrapped up bread for the next meal. I even grabbed a couple of those tender apricots for later, as well. Nello is the most gracious owner/host and his wife is a divine cook! 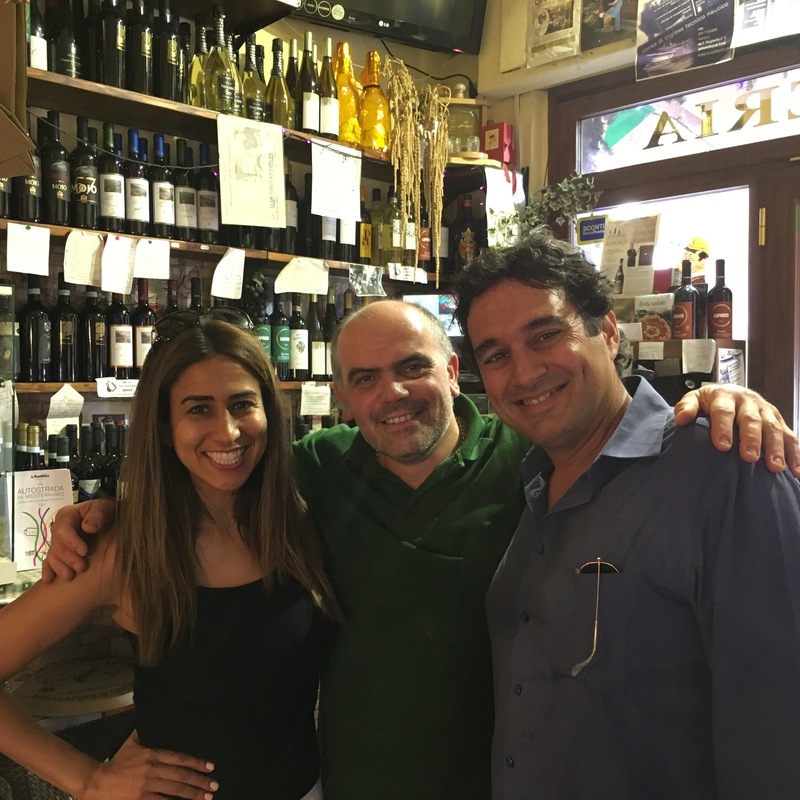 So if ever in the Amalfi Coast, and you find yourself on the windy road, go visit Nello! Tell him I sent you (not that he will remember, I am certain, but he was SO lovely!) and enjoy an authentic Italian surprise.